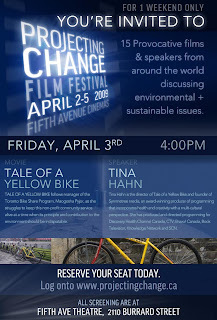 TALE OF A YELLOW BIKE - Screening at Projecting Change Film Festival! In a world of automobiles, can one yellow bike make a difference? Of course not. But a fleet of bikes might create a new model for sustainable transportation. TALE OF A YELLOW BIKE follows manager of the Toronto Bike Share Program, Maogosha Pyjor, as she struggles to keep this non-profit community service alive at a time when its principle and contribution to the environment should be indisputable. Showing at the PROJECTING CHANGE FILM FESTIVAL on Friday, April 3rd @ 4pm. Projecting Change Film Festival is Vancouver’s only film festival focusing on social and environmental issues. The second annual event kicks off April 2-5th at Fifth Avenue Cinemas. From talks with David Suzuki to Sundance award-winning films, Projecting Change's diverse line-up offers something for everyone. Action through Entertainment: the power of film unveiled! CAR-FREE VANCOUVER DAY 2009 is happening! Car-Free Vancouver Day 2009 will mark the fifth year since a buncha crazy East Van visionaries first decided to take back their street for people, and say no to cars. Since 2005 global consciousness has expanded exponentially, and in 2008 the meme exploded into multiple community car-free festivals, with around 125,000 people coming out to celebrate and play in the streets. The car-free future of our magical city is becoming clearer every day. YOU are the people who made Car-Free Vancouver Day such a groundbreaking, pavement-popping success, proving that massive, grass-roots, volunteer-led car-free events can and will happen. The people jive, businesses thrive, and our streets come alive. It's time to come out and be a part of the fun. Every Festival is independently organized and produced, with 100% volunteer labour. Many people report volunteering for CFVD as one of the most gratifying experiences of their lives. Get involved, and help shape your world. This year 's festival nodes are: Commercial Drive, Kitsilano, West End, Main Street, and Dunbar. Once again, the Festivals will happen more-or-less simultaneously, each with its own distinctive flavour and style. Each Community Festival is now organizing into festival PODS. A ‘pod’ is an independent crew who take an idea and runs with it... such as site management, spoken word, DJ, bike circus, street food, kids zone, yoga, healing, street hockey, barricades, volunteer, recycling, live music, and so on (you get the idea). They report to the overall ‘organizer’ pod to seek guidance, support, and (sometimes) modest funding as needed. Also needed are artists, designers, tech peeps, poster crews, logistics gurus, stage managers, puppeteers, and weather doctors. Being part of a Fest POD is an amazing experience in creative, organic structure. And of course, each Fest ultimately depends on a small army of day-of helpers to staff barricades, set up, clean up, run about, be "donation fairies", support volunteers, and make sure everything runs strictly in accordance with the rules of joyful chaos. So if you want to contribute on the day-of, for an hour or two or more, please put your name forward now and organizers will get back to you as the date gets closer. And don't think you necessarily need to participate in your "home" community -- this is our city, and it belongs to all of us. So feel free to volunteer wherever your sense of adventure leads. So please, come to one of the following organizing meetings, or contact the relevant organizer NOW! Check the website frequently for updates. Our website is www.carfreevancouver.org -- check it out and sign up now for fast-breaking news and information about all the Fests. 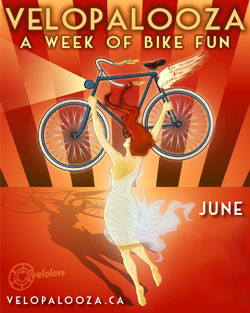 Onward to Car-Free Vancouver -- taking back our streets...for FUN! Next meeting is Sunday March 29 (check for confirmation). Kits is organizing on the "block-party" model. Dunbar is organizing on the "block-party" model. 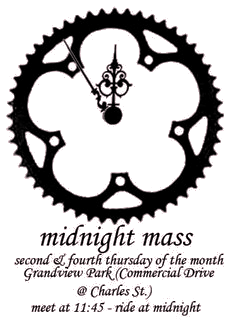 On Friday, March 27, a group of supporters of BC-STV will participate in the regular Critical Mass ride. Just as Critical Mass empowers cyclists to take back the road, BC-STV empowers citizens to take back our democracy. Did you know that under our current voting system, approximately half of all votes are wasted (meaning that half of votes cast don't elect an MLA)? Is it any wonder that so many people don't vote? If BC-STV becomes our new electoral system, 80-90% of votes cast will go towards electing an MLA. BC-STV was chosen by the Citizens' Assembly on Electoral Reform. They chose BC-STV because it produces fair results, offers greater voter choice and encourages cooperation amongst political parties. Isn't it time for an end to swing politics in BC? If you support electoral reform, please join us on March 27! For more information, visit www.stv.ca. A small machine has been brought onto the site through an adjacent property rather than the road access where the blockade is. A larger machine to do the actual demolition could be arrive at any time - we expect the ministry's contractors to attempt demolition later today or tomorrow. So if you were planning to come out, make it today or early tomorrow morning. See post below for directions. The last intact residence on the proposed freeway alignment in Surrey's Bridgeview neighbourhood is slated for demolition TODAY -- MONDAY, to be replaced by an ugly pile of "pre-load" sand. Bridgeview was hit first and hardest by preparation for the SFPR freeway, which feeds a longstanding desire on the part of government and developers to completely industrialize this multicultural working family neighbourhood. A small group of resisters from Surrey, Delta and Vancouver are NOW outside the house preparing to stand in front of the bulldozers 24/7, in support of this community and in solidarity with the Day of Civil Disobedience Against Climate Change throughout North America. THIS ACTION IS GETTING GOOD MEDIA ATTENTION -- BUT WE NEED YOUR SUPPORT NOW! The fight is far from over -- and while many homes in other areas along the path of the freeway are still months from the prospect of demolition -- this is a great opportunity to make a stand against the bulldozers in Bridgeview! And with PM2 financing just collapsed, there has never been a better moment to grind Falcon's face in the sand. If you can lend your supporting to this action, even for an hour or two, please contact Tom IMMEDIATELY at 604.588.4203, or just come to the corner of 124 St and 116 Ave. in Bridgeview asap (its about 1/2 hr by SkyTrain from Broadway SkyTrain station). Snacks, warm drinks and good cheer much appreciated!